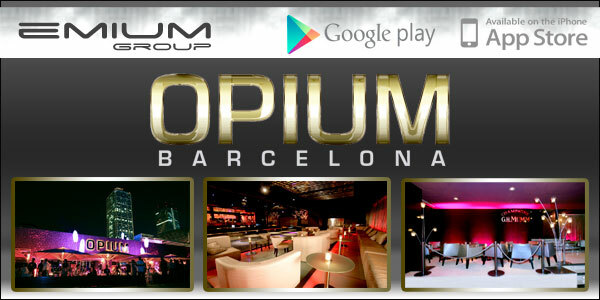 Opium Barcelona: Information, promotions & guest list. Enjoy the most exclusive atmosphere booking a vip table at Opium Barcelona . You will enjoy a place more private and not have to worry about queues or crowds of people. Free entry or discount to access to Opium Barcelona. Do not pay more than others to enter at Opium Barcelona! Opium Barcelona is located in a fantastic location, close to the Arts hotel facing the beach of Barceloneta, playful and versatile space that perfectly combines the inherent benefits of a daytime restaurant with the largest terrace in Barcelona by the sea, with the concept of leisure most current at the restaurant-bar-disco night. The spectacular location, high quality service and restoration, together with its innovative, cool and cutting edge design make a perfect setting opium.